Floral motifs, usually inspired by the creative achievements of women designers. It happened this time: the competition “Rodchenko-2011” Young Moscow designer Albina Basharova submitted a draft transforming floral sofa Fiori Divano, with whom he won first prize. Attractive appearance, exactly repeating the shape of the plant, sofa Fiori Divano like women and children, and will smile at men. Oh very nice and naive as a child is a project of modern furniture. 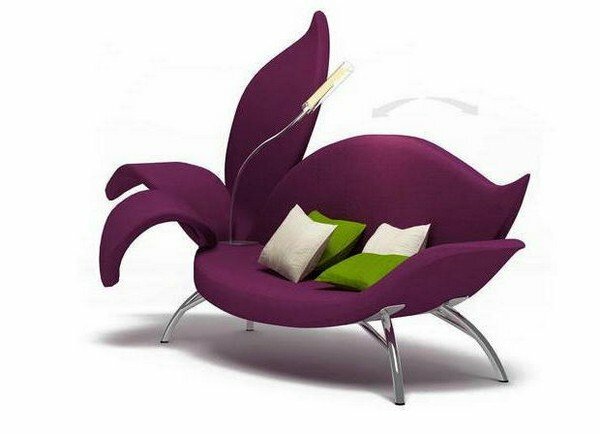 However, this does not reduce all of its advantages: recline sofa converts into a comfortable couch “boat”, and the petals give additional support to the back and serve as a kind of arms or stand for a laptop or a book.